Written by j. walkos on Friday, May 28th, 2010 at 9:00am. Tom Fec, the mastermind behind O&B Best Of 2009 alum Black Moth Super Rainbow, is back with his other project. Tobacco is a psychedelic, glitch-pop, one-man supergoup that’s one acid trip from the loony bin — in a good way. With Maniac Meat, Fec continues the electro buzz-saw sound he created on his first full-length, Fucked Up Friends. Shying away from the ambient, slowed-down grooves of Black Moth Super Rainbow, Maniac Meat is, well, meatier. The more robust, aggressive sounding effort leans on Beastie Boy-ish beats and tons of synth layers. Lending an air of prestige to the proceedings, the one and only Beck (who Fec has said produced his favorite album ever, Mellow Gold) appears on two tracks. The pairing of Tobacco and Beck makes perfect sense; both have an affinity for glitchy hip hop beats and free-associative wordplay. “Fresh Hex” lays an organ loop straight out of Dracula over Beck’s half-rapped, half-spoken word flow. “Grape Aerosmith” showcases Beck’s celestial side as it besets your eardrums with a snapping beat and vaporizer synths. This oddball lyrical imagery and wordplay are a common theme throughout Maniac Meat. The instrumental track “Nuclear Waste Aerobatics” builds layer upon electro layer, swelling into psychedelia while remaining strangely danceable. “Motorlicker” boils in hazy electronic fuzz and distorted, whispering vocals that sound like an evil robot’s manifesto (I’m pretty sure there is a subliminal message telling me to drink the Kool Aid somewhere in there). “Unholy Demon Rhythms” has a glitch-hop, beat-boxed rhythm that is just begging to be sampled by some adventurous rapper. Sometimes the use of synths can feel like an auditory train wreck, but the many strange sounds and layers keep you from turning away. Ultimately, the album is held together by its gripping beats and electronic adventurism. 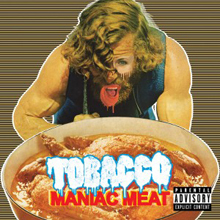 It’s like nothing you’ve heard before — with Maniac Meat, Tobacco has successfully carved out his own anomalous place in the modern musical landscape.